We literally want you to sit back and relax as you read this post. Hopefully, you’re sitting in the kind of office chair that allows you to do that. If not, then you’re going to like the suggestions we’ve gathered for you. You see, office chairs have a rich history in the United States and abroad. Some say the ancient Egyptians invented it, while others point to the 19th century. Either way, I think we can all agree that your chair is what dictates your level of comfortability. We’ve all sat in one of those rickety old “chairs” that can tie our back muscles into nasty little knots. And hopefully we’ve all felt the relief when we finally sit in a solid, well-constructed chair that supports our alignment and keeps us happy for eight hours (or more) a day. Which chair is right for you? Only you can decide that, but we’ve put together a few suggestions we think you’ll enjoy. The good news? The Aeron occasionally goes on sale on Amazon. In fact, right now it’s 15 percent off. The bad news? The sale price is $798.15 (it’s regularly $939). There’s a reason why this chair is so expensive: It’s arguably the best office chair on the market… ever. 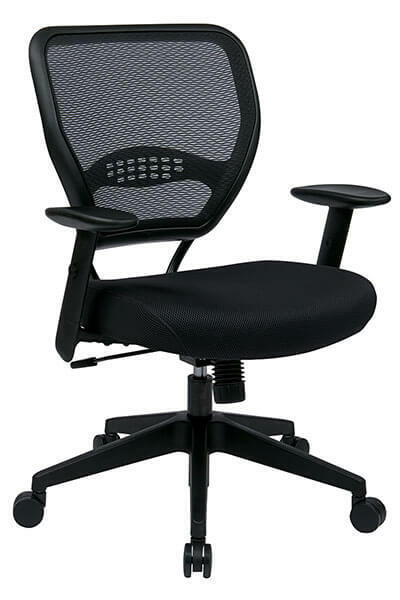 The Aeron was originally designed by two ergonomic geniuses, Don Chadwick and Bill Stumpf. Herman Miller loved the chair and it soon became a favorite among discerning customers. Sitting in this beauty of a throne all day doesn’t seem so bad, does it? If your bottom line can bear it, you might want to invest in the Aeron. The chair, according to Omincore, comes in three different sizes: A, B and C.
If you can’t pony up nearly $1,000 for the Aeron, consider the ever-modern Sayl. This chair, according to Herman Miller, contains the most complex part the company has ever created. You know the chair is going to be good when the designer says the back support is the most complex part ever created in the 80-year history of the company. The chair can be had on Amazon for about $510, around half the cost of its more famous big brother, the Aeron. 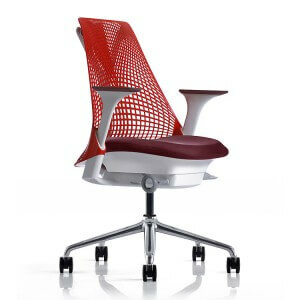 Plus, the Sayl has a 97.22% customer satisfaction rating on Smart Furniture’s Top-10 office chair list. “The Sayl earns its reputation as one of the most beautiful office chairs in Herman Miller’s stable,” Smart Furniture wrote. Word to the wise: This chair is better used as a conference-room piece. Task chair it is not, Smart Furniture says. This suggestion comes from the reviewers at Gear Patrol. The Air Grid is workmanlike in its design. It’s not flashy and it’s not fancy. It’s a simple, efficient piece of furniture. But don’t take Gear Patrol’s word for it, or even ours. Head to the chair’s Amazon page, where 952 people have given the Air Grid 4.7 out of 5 stars. While the Air Grid doesn’t give you that same legendary feeling that you’ll get from the Herman Millers we mentioned above, it does its job well. And for $144, it’s a steal for the level of quality it offers. To find out more, head to the chair’s Office Star product page. In the overall masterpiece that is your office’s layout and organization, chairs are just one part of an intricate orchestra of furniture elements. Stop by our website and take a look at our gallery, where you can see photos of our products at work in an office space.